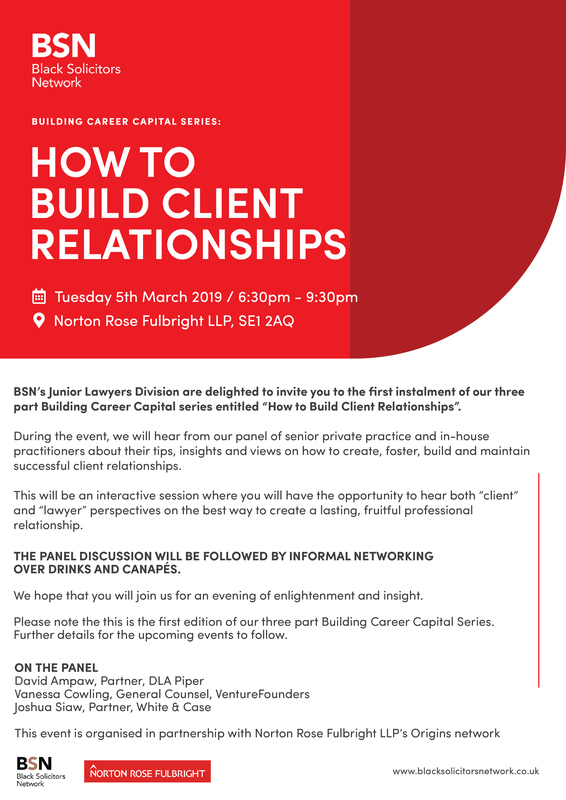 BSN’s Junior Lawyers Division are delighted to invite you to the first instalment of our three part Building Career Capital series entitled “How to Build Client Relationships”. During the event, we will hear from our panel of senior private practice and in-house practitioners about their tips, insights and views on how to create, foster, build and maintain successful client relationships. This will be an interactive session where you will have the opportunity to hear both “client” and “lawyer” perspectives on the best way to create a lasting and fruitful professional relationship. The panel discussion will be followed by informal networking over drinks and canapés. The deadline for registration is 28 February 2019.